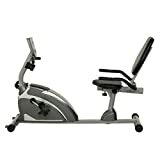 At Optimum-Fitness we are experts on Recumbent Exercise bikes, they are a regular part of our exercise routines and we know what makes a good bike, and which to avoid. Thats why we have all the Recumbent Bike Reviews you need to choose your next exercise partner. 2 First the benefits of exercising on a recumbent bike! 3 Why buy an indoor exercise bike in the first place (yet alone a recumbent)? 4 What is important when buying a recumbent exercise bike? If you want to step up to a more substantial bike than the 400XL then the 900XL from Exerpeutic does just that. With a larger adjustable seat and clear console, its easy to mount up the hours of cycling with this bike. The near silent drive makes it a great choice for watching TV or catching up on some reading. Its no wonder that this is one of the top selling bikes on Amazon! First the benefits of exercising on a recumbent bike! Why buy an indoor exercise bike in the first place (yet alone a recumbent)? If your goal is to either lose weight or to get fitter then along with a healthy diet you need to exercise. If you are lucky enough to live somewhere with nice weather then you may prefer to go running. Of course for running, all you need is a pair of trainers and you are set to go. Running is definitely the simplest form of exercise to get into. Come winter, or baking hot summers though, lots of people prefer to exercise indoors. This is where exercise bikes and recumbent exercise bikes come in useful. Depending on your personal preference you may wish to look at various options, such as treadmills, ellipticals, weight training etc. For many though the recumbent bike is the most versatile choice. The key advantage of the exercise bikes is that they are very accessible by all members of the household. If you have joint pain then running may not be ideal, and often men don’t like training on elliptical machines. This exercise bikes are often the first piece of exercise equipment bought by many. 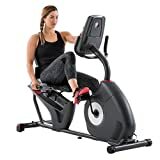 Modern recumbent exercise bikes, such as the popular Schwinn 270 recumbent, or the Sole Light Commercial Recumbent, now employ a host of advanced features. These range from the simple use of high quality materials to keep you comfortable to sophisticated displays to keep precise track of your workouts. Nearly all bikes have easily adjustable resistance increments, and feature heart rate trackers to keep your exercise tempo at precisely the right level to give excellent workout results. You may be thinking that these features are common to all exercise bikes. You would be right! What sets the recumbent bikes apart is the seating position. 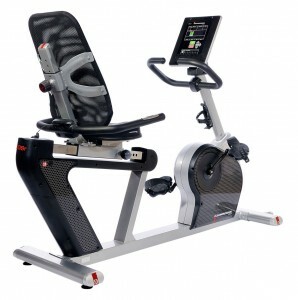 With a recumbent bike you are sitting down comfortably in reclined position. The first thing to note is that recumbent bikes are always bigger than their upright equivalents, and this does tend to make them a little more expensive! However it does bring a host of advantages. Being sat in this position takes a huge amount of pressure from the saddle. Recumbents are much more comfortable than an upright. This also means that the riders weight is far better distributed across the frame of the bike. This leads to longer lasting parts and components. Recumbent bikes, such as the recumbents we review on this site are incredibly durable. Its not uncommon to find bikes with lifetime frame warranty! One of the biggest issues, especially if coming back to exercise after a long break or injury, is joint pain. This is where recumbent bikes score big. The lack of pressure on the main joints, hips, knees, ankles means that it is possible to ride these bikes. Treadmills and upright bikes still apply a huge amount of pressure to the joints, and running in particular can be incredibly stressful on injuries. The impact on the body tissue on an exercise bike can prevent injuries from healing properly. When sitting in a recumbent the bike almost forces you into the perfect riding position. You are sat nearly upright, arms by your sides, and legs resting on the pedals in front of you. This makes them great for long periods of exercise and helps you get better results. Do you only have space for a folding Recumbent exercise bike? Actually this is not a problem. While there are not many on the market there are plenty of folding recumbent bikes to choose from. The big plus is that they tend to be the lower end of the price range. We have reviewed a number of Folding Recumbent Exercise Bikes, such as the Sunny and Health Folding Recumbent Bike and the Exerpeutic 400XL. Both of these options come in at less than $150 and are great options for new users tight on space. What is important when buying a recumbent exercise bike? 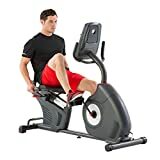 Ok so if you have made it this far and you are now considering buying a recumbent exercise bike then we will list the features that give the best bang for the buck! Often a recumbent bike is the first piece of exercise equipment that people buy. This can make the choice even harder, as you may not know the best brands to choose or what are the best models in each price bracket. The first consideration should be price. You need to choose a budget and stick to it. Try not to be tempted into buying a more expensive recumbent bike than you intend to. Manufactures are very good at getting customers part with with a few extra $ for additional features they may not need. A rule of thumb for quality is that you often get a better quality bike buying the entry level model from a higher end manufacturer, than a fully featured model from a lower quality producer. Recumbent exercise bikes come in at many price tiers, entry models such as the Exerpeutic 400XL come in at less than $150. Our all round pick, and overall best buy is the Schwinn 270 Recumbent.